Your driveway and the driveway landscaping that goes with it, is the entry point into your home. Take great care with the design and layout so that your visitors feel as if the driveway and the accompanying landscape invites them into your home......it should almost beg your visitors to enter and explore the rest of your beautiful home. Doesn't this driveway below look inviting? The owners of this home took great care to make their visitors experience pleasant when arriving at the gate. It feels as if you are going to enter a retreat....a tranquil haven where one can rest from our hectic and busy lives. 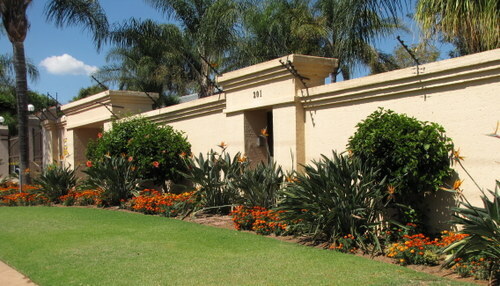 Landscaping driveways consist of both hardscapes and softscapes. And remember, if you ever want to sell your home, the way you designed and implemented your driveway landscaping, is the first impression the prospective buyers will have of your home and if done well, it will be a lasting impression too. If you look at the entry below you will see that it is nothing spectacular, but by shaping the trees, the owners created a very visual and inviting driveway landscape. So you can see that it does not need to be over the top. It just needs some imagination and creativity in order to stand out from everyone else. These are the types of special touches your visitors will remember and that is the type of thing that makes a lasting impression. That is why it is so important to take care with your driveway landscaping. Your imagination can really be put to the test and depending on the size of your yard and the space you have, you can include water features, rocks, flowers and plants and special design features with some unique lighting techniques to enhance the experience of your visitors arriving at night. Always remember that the driveway landscaping is just a part of your bigger landscape design. It is therefor important to make it flow into the rest of the garden...... and from there again into your home. It is important to create a harmonious effect. The hardscape should complement the rest of the home. In South Africa, we make use of brick extensively. If chosen well, the brick can compliment any house facade and it is not as harsh as plain concrete or a tar driveway. 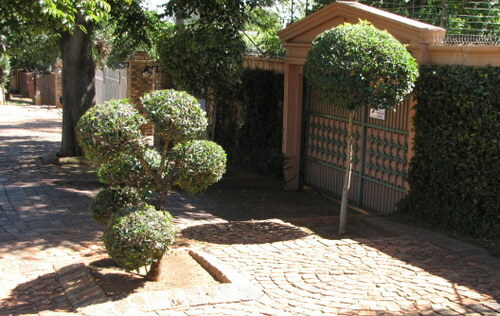 It is easy to shape as you wish and the plants can really create a stunning effect together with the brick driveway. The flow of the driveway and the landscape is important. There must be cohesion between the two...... remember what you want to create here; an inviting and friendly entry into your home. Integrate the two...... use the driveway and the landscape to compliment each other. Always use the best quality material you can afford. It is no use to try and "save" a few cents when it comes to implementing your driveway landscaping ideas. BUT it is also not a good idea to go into a lot of debt when you do any do it yourself project....... keep a balance always. Rather take great care with the quality of your design implementation..... the hardscapes and the softscapes. Quality shows and that is what really adds value.....not only to your experience when you enjoy the fruits of your labour, but to everyone that enjoy it with you. It shows that you care and that is what makes the difference between mediocre and excellent driveway landscapes. 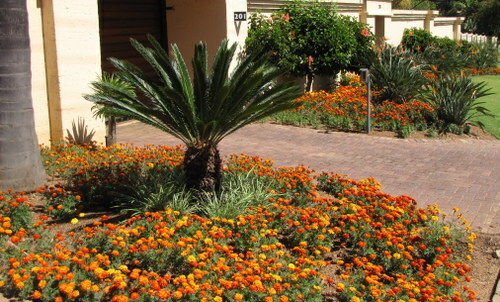 I always feel that the plants should be the focus point of your driveway landscaping. 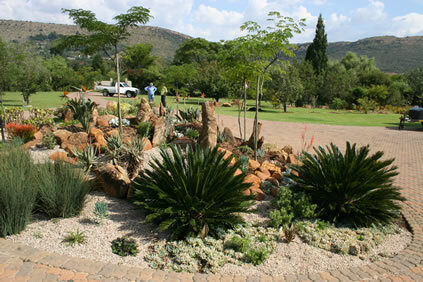 After-all, plants are the essence of any landscape design and that is what give us so much pleasure. Don't get me wrong, I absolutely love to design and implement hardscapes as that is what gives dimension to a landscape. But a hardscape without plants and other features to soften it, will never have the desired effect. Planting gives that nature's edge to any hardscape and softens the harsh lines. Plants however can easily be damaged, so take great care when planting your driveway. Never plant to close to the edges and always chose plants that are low growing for the first 1 meter from the edge of the driveway. People getting in and out of cars can easily damage your plants with the doors or even stepping onto them if you did not leave enough space for them to get in and out of their vehicle. If you live in a warm climate, always choose plants that love the heat. 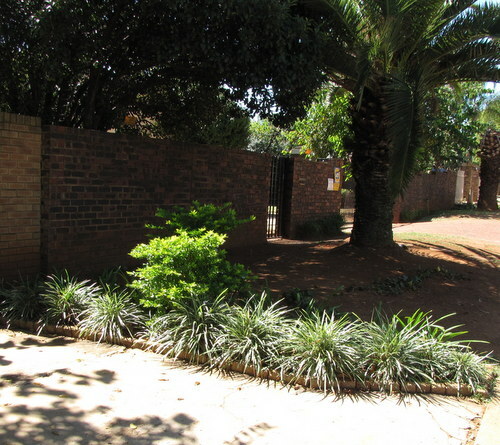 A driveway in South Africa can easily reach and emit temperatures in excess of 50 degrees Celsius. If you live in a cold climate in the northern hemisphere, you will have other considerations. Consider hardy plants that are salt tolerant. Remember that plants grow, so plant them well away form the edges that they don't overhang the driveway when mature. That also prevents the roots from damaging the driveway and vice versa. Just as the plants should be protected it is also important to prevent damage to your visitors vehicles when they park in your driveway. Tall trees to provide shade must be carefully selected. Avoid fruit trees at all cost. Acid from ripe fruits can really damage a vehicles paint work. Fruit trees also attract lots of birds and you know what birds do when they are indulging in fruit.....yes, you guessed correctly. And the defecation can stain paint work or leave very unsightly markings on your paving which will have to be cleaned regularly. So be sensible when you plant trees and shrubs that may cause damage to a vehicle. Make use of water features to create a tranquil environment. With our modern and rushed lifestyles it is important to bring tranquility back into our everyday lives. What better than the sound of trickling or running water? Water features can create a very inviting sound when you arrive home from work and stop in your driveway. It can already help for the transition from "work mode" to "home mode". And always accentuate the important features of your driveway landscape at night. Landscape lighting is such a useful tool and it adds such a huge amount of value for very little money. It is also something that with a little thinking and planning will give you much joy in implementing. It is not difficult and nowadays with everyone going green, the cost of running low wattage landscape lighting is almost negligible.